I'm sorry, you must have gotten the "crud" that I had two weeks ago. Take the antibiotics. As for me, plain tissue. Usually though, we have rolls of toilet paper on every flat surface of the house. Oh no, not The Crud. That's the worst. I hope the horsey pills make you feel better. Perhaps if we squeeze the camel, we'll get enough vitamin C to help. Or not, because now that I think about it, that's kind of gross. I prefer the super soft, but plain tissues. The lotion ones just get slimy. Addendum: Before you ask, pumpkins have lots of vitamin C (and A). Maybe have some pie? 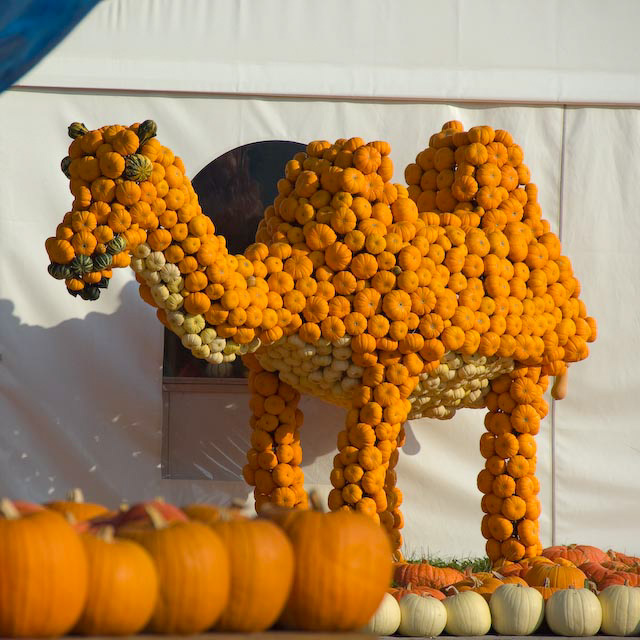 Pumpkin Camels need love, too. Do what the doctor says. at least the doctor didn't say "it's just a virus. give it time." that's the worst! take the antibiotics and feel better soon. and as for tissues? i prefer the soft kind, no lotion necessary. when you blow your nose as much as i do (allergies), any extra softness goes a loooong way. Stay on them medication and get some rest. Tissue with lotion! No contest. I'm still sniffly over here too. Blah! Oh yeah, lotion. I had some with Vicks embedded in them once...they were great during the cold, but I had to isolate them afterwards, the smell drove me nuts! It's a mighty fine camel! Especially since you managed to get it up here despite The Crud. Plain tissues. I agree with Delia, the lotion ones feel slimy. Handkerchiefs all the way. I found out the hard way if I switched from tissues the majority of my allergies went away. Also much more gentle on raw noses. Sorry the crud's got you. Feel better. Tissue question - I only buy the lotion ones when I have a cold and my nose is raw. And then I carry them around the house with me so I don't get them mixed up with the regular kind. Why? We wear glasses. You never want to clean your glasses with a lotioned tissue. Oh no!! I really hope you get better soon! And I think that plain tissues? The lotion tissues are kind of greasy. But I'm telling you -- better than tissues at all -- sinus irrigation! From the low tech netti pot to the one that looks like a water pik -- they are the best for cleaning out the crud. Plain tissues, definitely. Who knows what's in the other stuff? I started reading the comments and then Delia mentioned pumpkin pie. Now I have to have some. I like handkerchiefs. My dad had bought 52 at a yard sale and I inherited them when he died. They're soft. They slip into any washer load. And they remind me of my dad. I'm all about the lotion!!!!! Hope you start feeling better soon. And seriously...the camels??? You're the camel whisperer.